In 1960, Dr. Funk became the first full-time cool-season turfgrass breeder at a university in the United States. Dr. Funk had a productive career that spanned over four decades, and during his tenure produced hundreds of new turfgrass varieties, revolutionizing the turf seed industry. Dr. Funk was responsible for developing landmark cultivars of ryegrass, tall fescue, bluegrass and fine fescue. Dr. Bill Meyer, turfgrass breeder, joined the program in 1996. Under the leadership of Dr. Meyer, the Rutgers turfgrass program has evolved into the leading turfgrass breeding program in the world. It also maintains the largest germplasm pool of cool-season turfgrasses available for breeding. Dr. Stacy Bonos, professor and turfgrass breeder at Rutgers, joined the program in 2003 and was awarded the Early Career Excellence in Plant Breeding Award by the multi-state Plant Breeding Coordinating Committee. 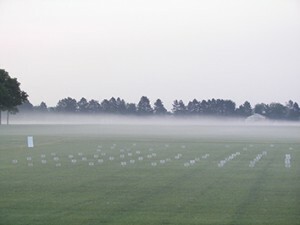 At the Adelphia farm, there are currently over 36,000 individual turf plots under evaluation. Over 25 acres are used each year for spaced-plant nurseries for seed production and clonal germplasm evaluation. Since the inception of the Rutgers Turfgrass Breeding Program, over 500 improved cultivars have been developed and marketed in cooperation with the seed industry. At Adelphia, there is now an extensive breeding and evaluation program for bioenergy grasses, comprised mostly of switchgrass, directed by Dr. Bonos. She is also evaluating Miscanthus as a bioenergy crop. Another exciting program conducted by Dr. Bonos is the development of cool-season grasses with improved salinity tolerance. In the past eight years new emphasis has been placed on developing turfgrasses that require less water, fertilization, and mowing. These low input sustainable turfgrasses are in strong demand.